Rachel has been bugging me for awhile to put up the pizza dough recipe we actually use to make pizza, as we don’t use the “Homemade Pizza” recipe from way back when. Actually after she put up that post, I was talking to the guys at Apizza in Stayton, Oregon and Shannon suggested a few changes, most of which I remembered but I’m not sure if I still do everything as he suggested, so you can assign authorship to whomever you’d like. Either way, Apizza is probably one of the 5 best places in the U.S. that I’ve had pizza, so you should check them out if you’re ever near Portland or Salem in Oregon. Put the yeast into the water and let sit until the yeast dissolves, about 5 minutes. In a food processor with the dough blade, combine flour, salt, olive oil, and yeast/water mixture and process until the ingredients form a ball. This may require the addition of flour. Take dough from food processor and put it on a floured surface and knead until dough is smooth, about 5-10 minutes. Prepare a large bowl by coating it with olive oil. Place dough in bowl, cover with plastic wrap, and place in the refrigerator until it doubles in size (or more, if you aren’t the type to check it constantly. Just makes sure it gets quite a bit bigger than when it went in.) Depending on the enthusiasm of the yeast, this could take anywhere from 4-5 hours to overnight. I’ve had no problems doing the dough in the morning and having it ready for dinner. If it just doesn’t seem to be working, do a warm rise in the way described in the original recipe, and if necessary stretch the time to 2 hours of warm rise. Punch down the dough, cut whatever size you need, and roll it out on a lightly floured surface. 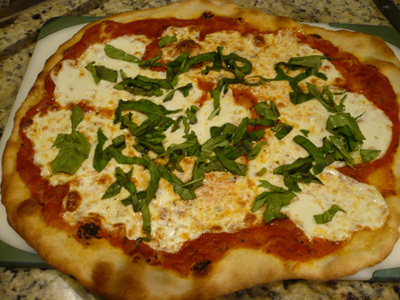 Place your pizza stone in the center rack of the oven and gun your oven as high as it will go. Make loud, enthusiastic noises to celebrate this opportunity to push your oven to its limits. When I roll out dough to make a pizza pie, I use a lightly floured wood French rolling pin and I roll it out pretty thin. I put some corn meal on the pizza peel (not too much!!) and put the dough on there…it’s a pain to top the pie on your board and then put it on the peel. I lightly brush the surface of the dough with olive oil and then top. It will bake for 6 or 7 minutes — I try and take it as brown as possible without burning. Take a ball of dough about half the size you would use for a pizza and on a floured surface roll it out in an oval shape about not more than 1/4″ thick. 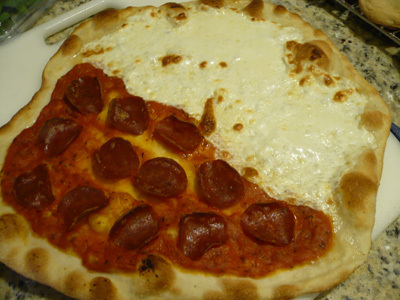 Cut width-wise into strips using a pizza peel. Bake for 5 to 6 minutes.